This entry was posted in Uncategorized and tagged Blood, Chris Carter, Cover-ups, Elvis Jokes, Half-Caff, John Shiban, Morgan and Wong, The Pine Bluff Variant, The X-Files. Bookmark the permalink. I actually was with this episode, more or less, until the final minute or so. I particularly liked the performance of the actor portraying Funsch. But Mulder looking down at his cellular to call Scully and seeing ‘ALL DONE!’ in a weird forerunner to a text message was just… hokey? It was feasible that the LSDM put people in a vulnerable state, and that the electronics were simply the means by which their fears were given a voice, but this final scene lends itself more to the notion that there is some conscious entity behind the curtain, typing this stuff up. And that, as you said, is quite far-fetched. I think the LSDm put the person’s mind into a certain state after which a human operator lurking in the shadows would control him/her. Is this episode out of chronological order? What I mean is that the X-Files is closed at this point and it looks like Mulder and Scully are on a normal case. It seems that this episode takes place later on in Season 2 chronologically speaking. Officially the X Files haven’t been re-instated yet, but you wouldn’t know the difference. I’ve just rewatched this episode, and personally, I enjoyed it. I came away with the impression that the ‘subliminal message’ hypothesis was just one of Mulder’s half-baked ideas (always with the government conspiracies! ), and that the digital display threats were just a (admittedly, not terribly realistic) manifestation of the LSDM-heightened fear response. One of my favorites. The ambiguity is why it is so brilliant. Very paranoid. Interesting premise for an episode, but way too many plot holes and absences of logic for one to even attempt to reconcile in their own what is actually happening here. I actually didn’t mind this episode, until the last moment. For myself, I could actually somehow buy into Mulder’s original theory that the LSDM was heightening people’s phobias and that electronics functioned as a subliminal message mechanism. It made sense. And the whole controlled experiment thing *sorta* made sense too. But then at the end, when Mulder’s phone flashed, “all done, bye bye,” that’s when I couldn’t justify it. It was just too vague and left open so many plot holes. Who was planning the experiment? Why did only certain people react? Plus, if it only reacted to phobia’s, didn’t Mulder have a phobia of fire? I just, there was too many inconsistencies. It didn’t make sense. I think if the show had just ended with the whole chemicals mysterious harming ppl plot, the episode would’ve been better. I always interpreted it as the LSDM weakening certain areas of the brain to make the more susceptible to suggestibility, hallucinations, and paranoia. I think that what the people saw was all in their heads, but the electronic devices sent out signals that triggered those responses in the brain, and because everyone’s brain is different, everyone interpreted things in different ways. Mulder theorized subliminal messages, but maybe they were more like generic signals? I think so. The people created their own subliminal messages in effect. The electronics were just a medium in which to turn them on. I assumed that the subliminal messages were real and that they were equally visible/invisible to everyone, but that only people who had been primed with the drug were susceptible to them. 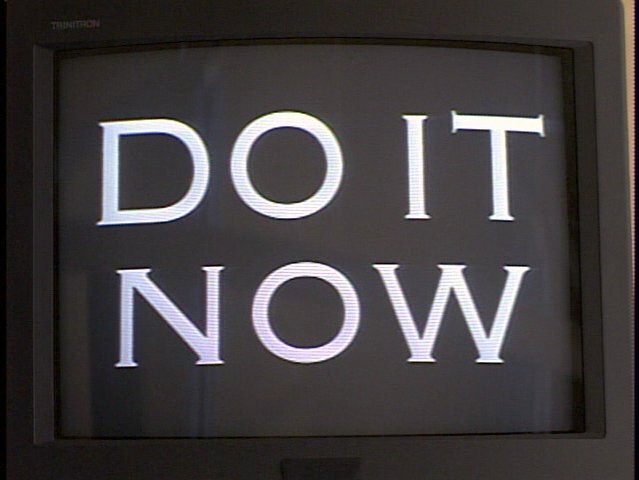 So if Mulder looks at a display flashing “He knows” at him, he might take in the message in a subconscious way, but it doesn’t register or lead to any particular action on his part. Whereas when Mrs McRoberts sees it, even though she’s not consciously aware of it, it feeds her paranoia and leads her to think the cops must be onto her.